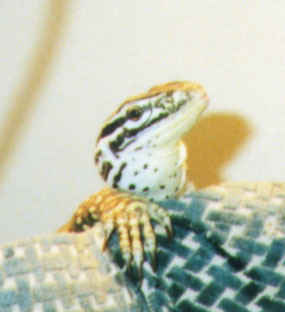 When Super-K died, I went looking for a male argus monitor I could use to father the eggs that Chris kept producing. I went to a reptile store in Kent called Rare Reptiles, where I found Oz. Oz was still not quite grown, so I took a gamble that it was a male and bought it. I remember just before I obtained this new addition to my collection, I asked to see it eat to make sure it was in good health. One of the people who owned the store threw in a mouse and Oz nearly ripped its head off with the ferocity of its attack. There was no way I could pass up a lizard that cool. It turned out that Oz was female. I also found out that female argus monitors really hate each other. At least mine cannot stand the sight of each other. 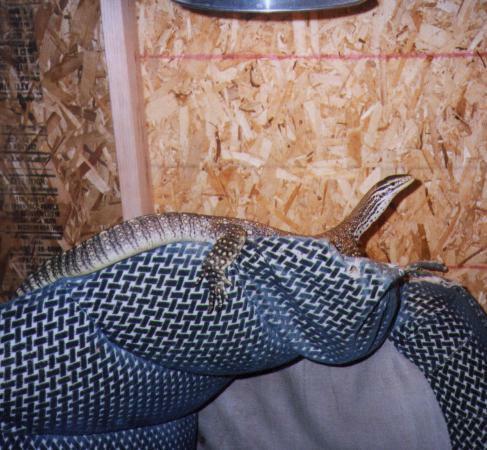 I have heard other people talk about how their colonies of argus monitors get along, but I suspect that they have to be raised together for this to happen. In any event, Oz and Chris would attack each other whenever they had the chance. I later found out that they would attack Irvine as well (poor Irvine was already weak and suffering neurological symptoms from her disease and could not defend herself. The resulting wounds did not help her any). At first, Oz's attacks would scare Chris away, but Chris soon found the courage to stand up for herself and turned the tables on the slightly smaller Oz. It was obvious I would have to separate them if I was not to end up with badly mangled or dead monitors. Oz now lives in a large walk-in closet with a gutted, ripped up couch for a hide box/basking spot/burrow/jungle gym/play toy. She seems quite happy in there. When spring comes and it warms up, I'll try introducing her to Hall in hopes that they will make babies together. Update: Feb 22, 1999. I recently introduced Oz and Merrimac, and they almost immediately started courting and mating. This behavior went on for several days, nearly nonstop. Update: March 22, 1999. On march 15, Oz layed 7 eggs in her nest box. 3 have since turned yellow and shriveled, the remaining four are still white, plump, and live-looking. I have high hopes that these are fertile. April 27, 1999. After the big move, from my apartment in Seattle to the house in Montlake Terrace, Oz seems to be doing fine. I hauled her couch over to put in her new cage, and she hides in it and basks on top of it just like before. I think she is gravid once again. January 21, 1999. Oz was dead this morning. I have not yet had time to take her in for a necropsy. She had blood on her and bite wounds to both arms. I suspect she dies of trauma, and Hall obviously bit her, but I am not sure if Hall killed her or if he just tried to scavenge her after she died. Oz basks on top of her couch.